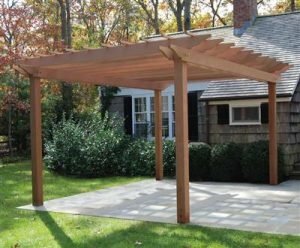 A pergola is a unique architectural structure, blending the interior and exterior of a space. It can be used to define a passageway or frame a focal point in your yard. Add a climbing plant such as wisteria or, yes, grapevines, and your pergola will provide colour and shade as well. 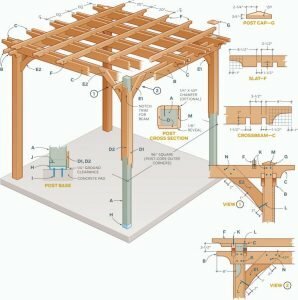 Given below is a simple step-by-step guide to build a pergola that fits on an 8 ft. square, but it’s easy to modify it to suit your site. Available in standard sizes and grades Western Red Cedar from Canada is the material of choice owing to its natural resistance to termites and decay. Leave it unfinished and let it gradually turn grey. Or, apply a stain or sealer designed for exterior use. The posts are composed of pressure-treated 4 x 4 cores that are sheathed with 1 x cedar. Secure the post cores to a concrete pad with steel post-base anchors. If you’re not building on a pad, use longer posts and set them in the earth. Lay out the post positions and mark the screw locations. Hold each post plumb and drive nails through the anchors into the wood. If necessary, brace the posts so they stay plumb. Cut the four 2 x 6 western red cedar support beams to length, use a template to mark the curved notches at the ends and cut the notches with a jigsaw. Clamp the beams in place, and check that they’re level and that the posts are plumb. Then secure each end with four 3-inches No.10 screws. When adding the second of each pair of beams, check that they’re level across the top edges. Step III: Adding the Crossbeams. Cut the notches with a dado blade in the table saw, or lay out each notch and use a jigsaw to remove the waste. Then, make the curved end cuts. Install the crossbeam pairs at the posts first. When they’re in place, bore screw holes down through their top edges and screw crossbeams to the support beams. Then add the three remaining pairs with similar spacing. braces to the posts and beams with screws. Cut the five 2 x 4 slats to length and shape the ends. Clamp each slat in place and mark the crossbeam notch positions. If you use a table saw and dado blade to make the cuts, be sure to support the long stock at the opposite end. Then, bore pilot holes and attach the slats with 3-in. No.10 screws. To make the post caps, cut square blanks and then set the table saw blade to 15 degrees for shaping the bevels. Use a longer board with a stop across the end as a sled to guide each blank through the blade. Clamp the blanks to the sled when making the cuts. Secure the caps with 6d galvanized finishing nails and construction adhesive. And your pergola is ready with the best high quality timber.